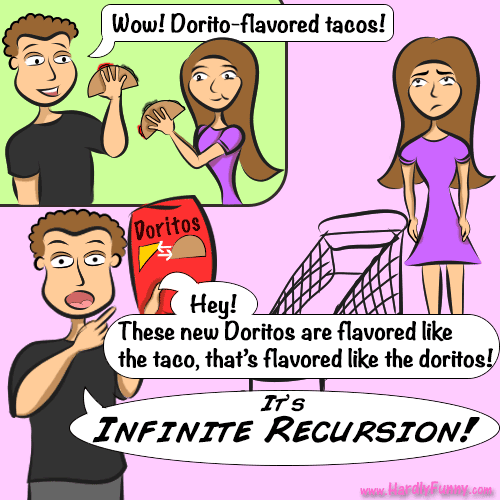 It was really embarrassing when Randall started yelling “Infinite recursion!” in the grocery store. I didn’t know how to calm him down. I didn’t want to explain, to strangers, the excitement of his epiphany, mostly because people just won’t understand. There’s a new taco at Taco Bell, flavored like Dorito chips. After it became popular, Doritos had to continue flavoring things…. Doritos now has a new chip that is flavored after the taco that was initially flavored after themselves…. It is like a never ending loop! This entry was posted in Posts and tagged married life, things randall says by Samantha. Bookmark the permalink.